In October of last year, free-to-air network 10 unveiled an all-new look in collaboration with branding agency Principals. The agency and the network reveal what went into the sweeping rebrand. By Brooke Hemphill. This article originally appeared in The Truth Issue, our October/November 2018 print edition of Marketing magazine. In late 2017, CBS, the most-watched free-to-air network in the US, acquired Network Ten signalling the start of a new, stable era for the network. With this new owner and a new lease on life, 10 was ready to change things up. The most visible change would be a whole-of-company rebrand, the first in 27 years. For a task of this nature, 10 needed help and branding design agency Principals was called on to assist with the process. While a rebrand was important to signpost this fresh new era, it was also important that the heritage of the brand remained. The view was that 10 needed to rediscover what had made the brand great throughout its more than 50-year history. “The whole branding exercise was one of going back and finding out what made 10 successful in the past,” explains Bull. Some of 10’s greatest hits over the years have broken new ground such as Number 96, The Box, Puberty Blues, Prisoner, E Street and The Secret Life of Us. Using this insight, Principals and 10 articulated a vision for the network: to be Australia’s leader in escapist entertainment. Through qualitative viewer research, a positioning for 10 emerged as an escape from the politically correct world to a feel-good place that allowed viewers to break free of the grinding responsibilities of life. The same research helped define the target audience for 10. Compared to its competitors, 10 remains relevant to a broader range of advertisers due to its youthfulness. It became clear that 10 needed to own being the under 50s network. “What 10 needed to do was come up with a way of saying ‘Maybe we’re not as young as we used to be, but we’re still young at heart’,” says Bull. Qualitative research also explored the idea of archetypes and the archetype identified that best fit 10 was that of the jester. “It’s this playful, fun and cheeky kind of character. There was a need to recapture that in the identity,” Bull says. The work ultimately led 10 and Principals to establish the brand idea of ‘positively twisted’. The word ‘positively’ speaks to the tone of programming for which 10 is best known and ‘twisted’ references the network’s history of twisting genres to create new spins on traditional formats. The Project is a perfect example with its tagline, ‘news delivered differently’. A key dimension of the rebrand was the notion that the family of brands within the 10 group looked disconnected. In addition to the main channel, 10 offered viewers two multi-channels – One and Eleven – as well as catch-up streaming service Tenplay. Despite the catch-up service being branded Ten, it also contained content from One and Eleven, making for a confusing viewing experience. “The opportunity through the rebrand was to join up the family much more clearly,” says Bull. The concept of a master brand required a mindset change in terms of getting the business to think about the sum of the parts. “We wanted consistency across all our brands and to strengthen the deep engagement we had with our audiences by confirming our entertainment credentials across the 10 family,” recalls McGarvey. Once the master brand was established, other extensions of the brand were easily integrated such as the online content offering 10 daily and 10 All Access, which launched in December. Following multiple rounds of name suggestions, 10 Boss and 10 Peach were selected to replace One and Eleven respectively. “It was really about capturing the vibe or attitude of both of those channels, not so much focusing on the audience, but more on what’s on there. What’s the programming? What’s the experience of actually sitting down and watching or engaging with those channels?” adds Cargill. The thinking behind 10 Boss was that programming on the channel is driven by bold, self-confident characters, while 10 Peach offers feel-good escapist entertainment. 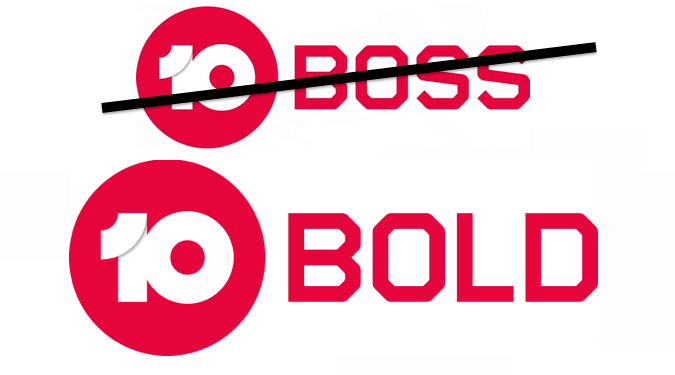 In later months, 10 Boss would go on to become 10 Bold with the name change still communicating the programming attitude of the channel. McGarvey adds, “With the new names, we wanted to give the channels meaning that reflects their target demographics. 10 Peach is targeted at 16- to 39-year-olds and the term ‘Peach’ is a feeling. 10 Bold is targeted at over 40s and the term ‘Bold’ is more of an attitude. The shows on the channels reflect this too. In many ways, the new look for 10 successfully maintains the heritage of the brand. The 10 master brand retained two out of three elements from the existing mark – the colour blue and the circle – while the 10 switched from the written word to the numerical form. Perhaps the most significant changes beyond the identity itself are 10 Bold and 10 Peach, which were given their own distinct personalities while still being very much part of the 10 family. XXVI also worked with 10 to develop a unique tone of voice for each of the multi-channels based on the archetype of the jester. “We needed to create some shape that went beyond the superficial idea of the brand being clown-like. We came up with a voice that spans the range from being fun to being quite direct, quite straight up,” says Cargill. The hopes for the rebrand are threefold. First, the goal is a sense of renewed confidence and pride in the business, and Bull says the network is already seeing strong signals of this. “It fulfils its primary purpose of giving the business something to rally around,” he says. On the viewer side, the intention is for a significant qualitative impact as this newfound confidence is conveyed to viewers. Practically, the work to bring the multi-channels in line with the master brand is designed to increase awareness of these offerings and, in turn, audience share. Of course, an uptick in ratings will be one way of gauging the success of the rebrand and, after one month, 10 Bold has already seen its commercial share grow. But the ultimate measure will be the share of advertising dollars. “Just one percentage point of share movement is many millions of dollars. So it can have quite an immediate impact if people start to feel more confident in the network and believe in its resurgence. It can really pay for itself quite quickly,” says Bull. Full disclosure: Brooke Hemphill is a marketing, communications and PR consultant of whom Principals is a client.